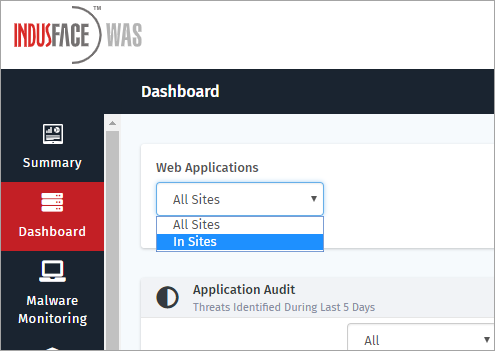 Indusface WAS is a zero touch, non-intrusive, and cloud-based software which provides daily monitoring and security that safeguards your sensitive data, checks for system and application vulnerabilities, malware and more. Click Dashboard tab on the left navigation plane. The summary details of the scans performed is shown in graphical format. The subscribed scan services are displayed for All Sites or a specific website as per the selection in Web Application drop-down. The attacks found are categorised into Critical, High, and Medium and the graphs are displayed accordingly. Drag & drop the widgets from top to down to customise or to change the existing order. Click to download the report in CSV format. 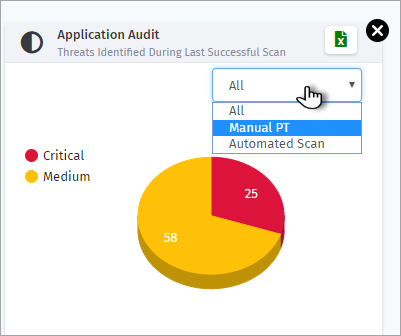 Click All drop-down of Application Audit widgets, click to select Manual PT or Automated Scan to view the report for either scans. 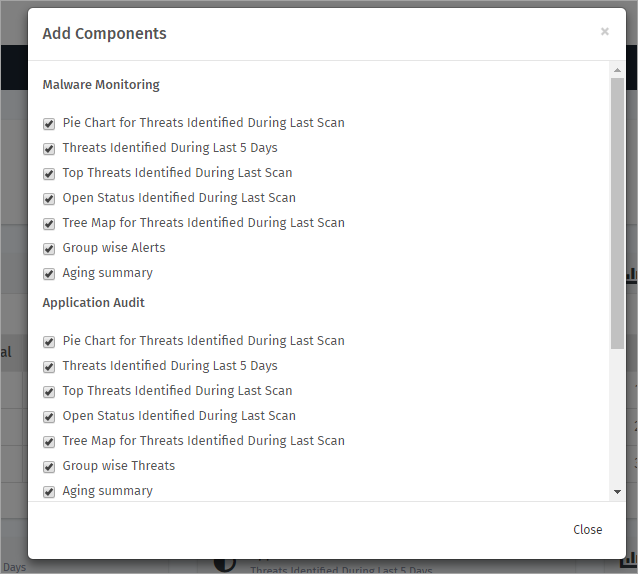 This option allows a user to add more components of any scan service and report type in the form of a widget. Click Add Component button. Add Components pop-up appears. Click to select a component to display it on the Dashboard page and click Close button. The added component is displayed on the Dashboard page. Similarly,to remove a component from the dashboard unselect the component. Click the selected component from Add Components pop-up and click Close button to close the pop-up. The updated components are displayed on the dashboard. Click Scan Status button to display the information on the scans and websites. Scan Status pop-up appears. This option displays the URL of the website. Number of the vulnerabilities found is displayed in this column. Download CSV link id given to view the attacks. This column displays the existing scan status like service inactive, paused scan etc., nothing is displayed when there is no scan performed. This column displays Start or Resume button as per the scan. Click Start button of a specific website to start a scan. Click Resume button to continue the scan of a website. 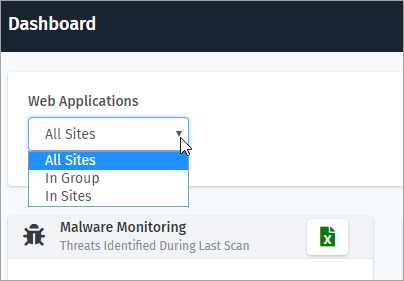 By default, All Sites option is displayed. 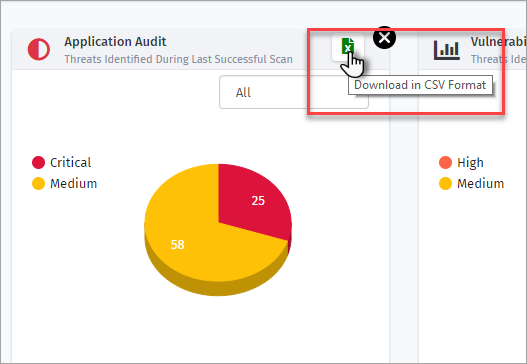 The Web Applications drop-down contains In Group(s) and In Site(s) options which displays the scan summary reports specific to a group or a website. Click In Group(s) option from Web Applications drop-down. Select Group drop-down appears. Click Select Group drop-down and click any group. The scan summary details of the group is displayed. Seal Status of a website(s), Threats Identified During the Last Scan with the scan type is displayed. Click In Site(s) option from Web Applications drop-down to view the details of a specific website. Select Asset drop-down appears. Click Select Asset drop-down and click a website to display the scan details. The Seal Status of the website and the subscribed scans with each scan protection status are displayed. 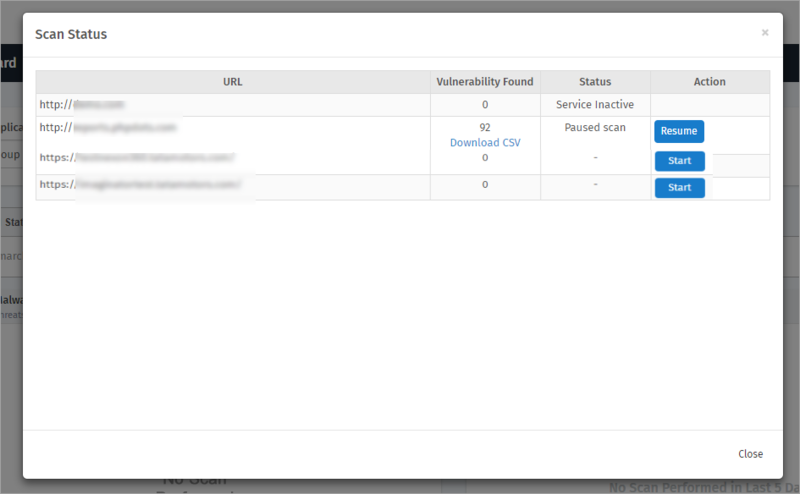 Components with the vulnerabilities found is displayed in the form of widgets. 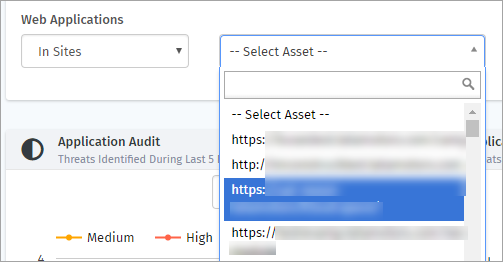 An Asset ID is a short and unique name that is given to a website. When dealing with multiple websites, creating Asset IDs is helpful. N/A is displayed if no asset ID is created. 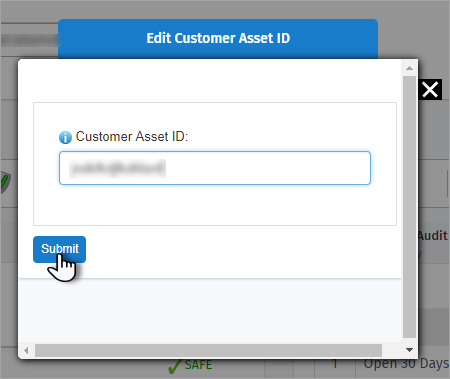 Click edit icon to set or update a Customer Asset ID. Edit Customer Asset ID pop-up appears. Enter any name of your choice and click Submit button.